There are various entry points for this trail including Claremont Rd, Miro St, Barnes St, Kowhai St, Nikau Pl, Matai Cres and Church St. There's something for everyone at the scenic Centennial Park Reserve. Cyclists of all ages and abilities can enjoy a wide range of tracks and trails on both gravel and dirt which offer a variety of challenges and scenic interests. Secluded picnic spots, waterholes, over 7,000 trees and numerous historic quarry sites are located throughout the 59 hectare reserve which is only 3 kilometres from the Timaru town centre. The Timaru Harbour Board once owned much of the land at Centennial Park, which was worked as a quarry in the late 1800s to provide a source of harbour-protection rock for the development of the Port of Timaru. Several quarries were operated, each supplying rock via a railway leading from Otipua Rd. In 1889 moa bones were discovered when a rock was being removed. The bones are believed to be the oldest discovered to date with the clay found under the bones being described as being from the Pliocene Age (2 to 7 million years ago). During 1934-35 negotiations took place to acquire land for a reserve and the land from Claremont Rd stretching east to the end of Quarry Rd, about 32 hectares, was bought. About that time George Bowker, a local real estate man, donated 6.5ha of land adjoining the Otipua Rd reserve. In 1935 the first of many trees and shrubs were planted. The reserve was known by many names in the past including "Harbour Board Reserve", "Quarry Reserve", and "Scenic Drive". In 1938 it was formally opened and named the Scenic Reserve; however, by 1940 it had been renamed Centennial Park marking the centenary of the signing of the Treaty of Waitangi. 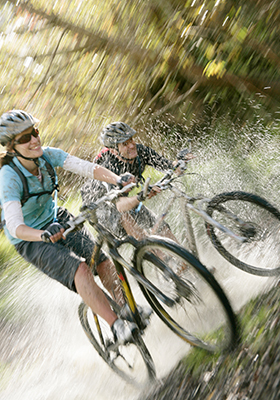 Many of the mountain biking tracks in the reserve have been developed by the South Canterbury Mountain Bike Club in conjunction with the Timaru District Council.